Today, Intel released new details on the chip manufacturing process it has been developing along with information regarding the first product that will come out of it. After a delay of over 6 months because of technical issues, the first product off the line will be Intel's new tablet focused Broadwell chip. According to the vice president of Intel's platform engineering group, Rani Borkar, the new chip offers seven times better graphics performance than previous models and twice as much power for basic computing. Haswell series chips improved battery life over all, but according to Borkar, Broadwell chips will offer twice the battery life with batteries half as powerful as what we are used to. The Broadwell Core M is designed specifically for lower power devices such as PC/tablet hybrids with fanless cooling systems. The chips use second gen Tri-gate (FinFET) transistors the company claims provide industry-leading "performance, power, density and cost per transistor." The technology was first used in 22-nanometer processors back in 2011. The 14-nanometer footprint is a result of Intel's new manufacturing process, that will be "used to manufacture a wide range of high-performance to low-power products including servers, personal computing devices and Internet of Things." Intel notes that its engineers have achieved more than "two times reduction in the thermal design point" in comparison to previous generation processors. 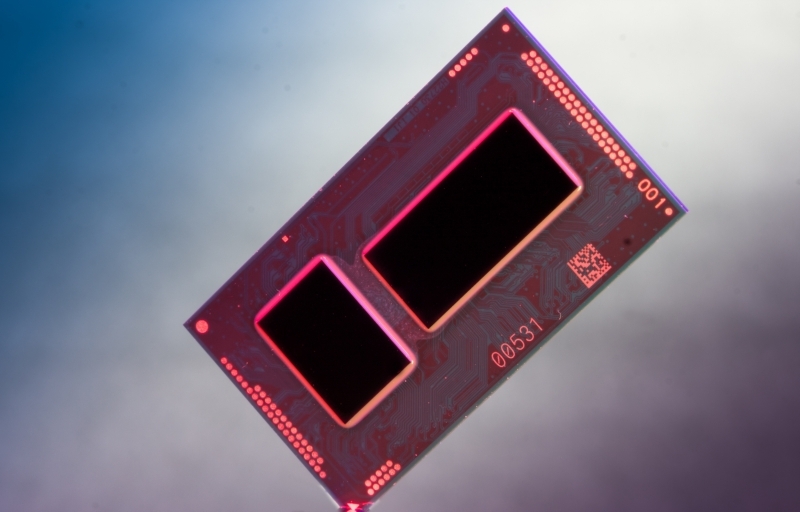 The new Broadwell Core M chip will appear in devices as early as holiday season 2014, with additional devices coming in the "first half of 2015," according to Intel.